The formation of hydrates in natural gas processing facilities and pipelines is a critical problem as it could lead to blocked pipelines and shutdowns and even to the destruction of valuable equipment. Because of these potential devastating and costly consequences, hydrate suppression methods are of great interest to operating companies. Injecting hydrate inhibitors such as methanol and Ethylene Glycol (EG) is one of the most common methods to suppress hydrate formation in the free water phase. These chemical additives thermodynamically destabilize hydrates and effectively lower the temperature of hydrate formation. For facilities, EG is generally the preferred choice as a hydrate inhibitor for continuous injection as it can be effectively regenerated and recycled. Accurate simulation of the EG injection and regeneration process is a challenging task as the conditions at the low temperature separator can be troublesome for flash calculations. A 3-phase flash calculation (vapour, hydrocarbon liquid, aqueous or EG/water) at low temperatures (in the range of -10 to -30 C) is required, and often the property packages available in commercial simulators are not tuned to properly predict the partition of heavier hydrocarbons between vapour, hydrocarbon liquid and aqueous phases at these conditions, or even to properly predict the existence of each phase. In this article, we present the results of process simulation of a typical EG injection and regeneration plant using different property packages in Aspen HYSYS. Typical values for the inlet gas analysis, Low Temperature Separator (LTS) pressure, LTS temperature, and glycol circulation rate were used to develop the process simulation case for the EG injection process. One of the important parameters in the operation and design of the inhibitor system is the amount of EG dissolved in the aqueous phase of the LTS. A good rule of thumb for the calculation of inhibitor flow rate is to use enough inhibitor in order to achieve 70-80 wt. % glycol in the rich EG phase. Table 1 shows the calculated EG wt. % in the rich glycol stream for different property packages in HYSYS as well as GRI-Glycalc software using the typical values for the variables outlined earlier. GRI-Glycalc is a Windows application developed in the late 1990s by the Gas Research Institute (GRI) and is primarily used for the estimation of emissions from glycol regeneration units. GRI-Glycalc uses Peng Robinson-UNIQUAC for the calculation of equilibrium in glycol systems. The Binary Interaction Parameters (BIP) for the GRI-Glycalc calculations are reportedly fitted to match the GPA research reports as well as GRI’s own experimental data . Table 1 also includes a column showing the results for HYSYS PR-NRTL (PE-BIPs) property package. Process Ecology has regressed the equilibrium data from the GPA Reports, GRI-Glycalc application as well as some field data and established its own set of proprietary BIPs for a PR-NRTL property package inside Aspen HYSYS. 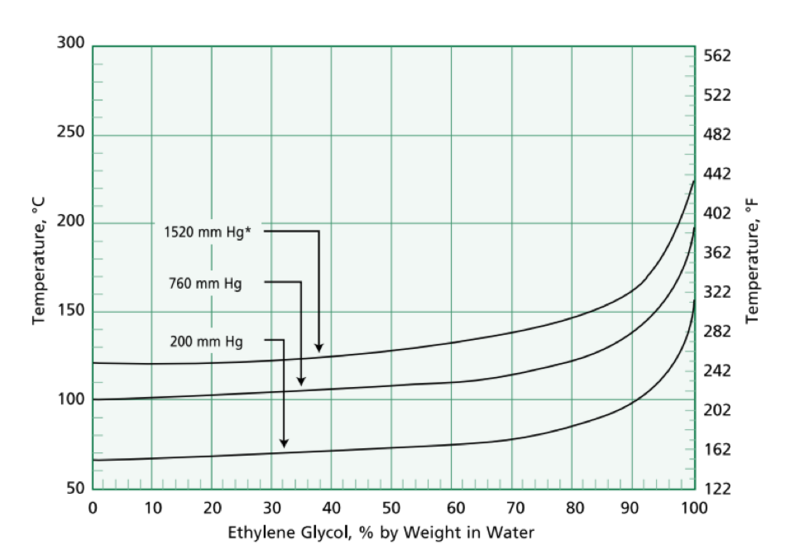 The native HYSYS Glycol package predicts a lower glycol weight percent in the rich glycol stream compared to the rest of the calculation methods. This can be attributed to a much larger hydrocarbon absorption in the aqueous phase predicted when using the Glycol property package. Table 2 shows the hydrocarbon flow rate in the rich glycol stream for each case. The results clearly indicate that the Glycol property package in HYSYS consistently predicts a much higher hydrocarbon absorption in the rich glycol stream compared to other calculation methods. “N/A” values in the GRI-Glycalc column indicate that the application failed to calculate the phase split at the LTS conditions. GRI-Glycalc and PE proprietary packages predict the hydrocarbon flow rate more accurately. The reboiler temperature of the EG regeneration column should be maintained at a level equal to the boiling point of the desired solution. Figure 1 shows the boiling points of various aqueous EG solutions at different pressures. Based on the operating pressure of the regeneration column in the reference Aspen HYSYS case (~ 120 kPaa), the expected reboiler temperature to have a lean EG of 70-80 wt. % would be 115-125C. This temperature range matches the typical range of the EG regeneration reboiler temperatures as reported in operating manuals . Table 3 provides the reboiler temperature as predicted by different calculation methods. GRI-Glycalc does not report a value for the reboiler temperature. Again, note the Glycol property package overestimates the reboiler temperature, while PR and the PE Proprietary package predict more reasonable values. BTEX emissions from glycol regeneration plants are a major health concern and are typically regulated in different jurisdictions. In Alberta, the Alberta Energy Regulator (AER) has a directive which regulates Benzene emissions from glycol regeneration plants . Table 4 shows the flow rates of BTEX components as well as Methane and CO2 in the EG regenerator overhead. The PR property package predicts almost no solubility of hydrocarbons in the aqueous phase at LTS conditions and therefore the BTEX emissions are zero. The Glycol property package overestimates the hydrocarbon absorption in the aqueous phase of the LTS, and therefore predicts very high emissions from the regenerator column. GRI-Glycalc and PR-NRTL using Process Ecology custom BIPs are based on GPA experimental data that has been used to fit BIPs for BTEX-EG systems and we can conclude it is the most accurate for prediction of emissions from the EG regenerator still vent. This article provides the results for the analysis of EG behaviour in low temperature systems. Based on the values for the reboiler temperature as well as the hydrocarbon content of the rich glycol, we believe PR is a better property package as compared to the Glycol property package when using EG in low temperature systems. However, PR cannot be relied upon for estimating the BTEX emissions from EG plants as PR underestimates the solubility of both aromatic and aliphatic hydrocarbons in the rich glycol stream. GRI-Glycalc and PR-NRTL with custom Process Ecology BIPs offer more reasonable results for estimating the hydrocarbon absorption in LTS conditions, however, as indicated in this article, one should be cautious when using GRI-Glycalc as the flash calculation often fails in predicting a liquid hydrocarbon phase at the LTS conditions, in which case all the hydrocarbon is sent to the rich EG stream and unreasonably high BTEX emissions will be predicted from the regenerator vent. Predicting benzene emissions in refrigeration plants – be careful what simulators tell you!